The Doric columns sit on a granite plinth and are constructed of brick coated with a deep terra cotta red stucco and decorated with bronze anchors and four pairs of bronze ship prows (rostra). Seated marble figures decorate the base of each column each representing the major rivers of Russia — the Volga and Dnieper at the northern Rostral Column, Neva and Volkhov at the southern one. 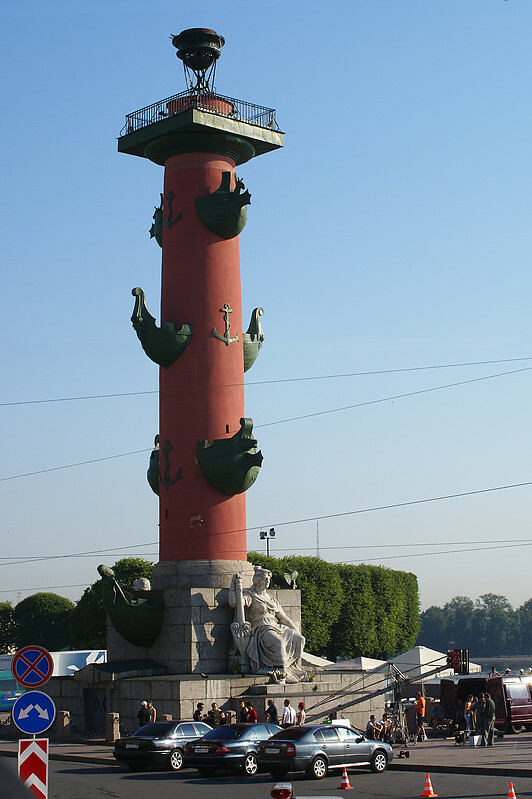 The Rostral Columns were originally intended to serve as beacons and originally were topped by a light in the form of a Greek brazier and lit by oil. The braziers have been removed and the tops of the columns refitted with gas torches that continue to be lit on ceremonial occasions.